Question: How do you get 265 years of intrusive vegetation cleared in only 3 days? Answer: Find two two old Jews and give them the job. 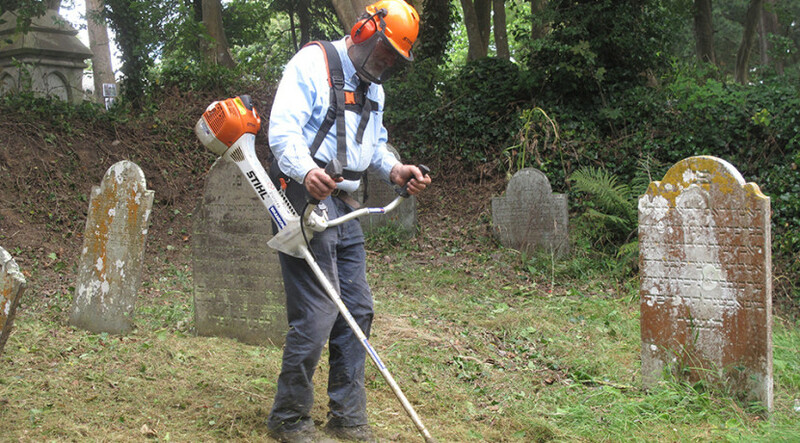 David Hearle and Anthony Fagin, members of Kehillat Kernow with a combined age of 144 years, using tools both ancient and modern, stripped back the vegetation and pollarded the self-seeded trees that for aeons had progressively been engulfing the site of the historic Jewish Cemetery in Falmouth. For the first time in generations it is now possible to see all the gravestones. Many still remain standing, albeit it at precarious angles, while others have fallen. Of those that have fallen, several have been vandalised. But at least a proper survey can now be undertaken of the remedial work that needs to be done to repair and re-erect the fallen stones in their proper places and to repair the perimeter walls and other architectural features of the cemetery. An alliance called Friends of the Ponsharden Cemeteries has been formed with volunteers responsible for restoring the adjoining Dissenters’ Cemetery and also involving representatives of Falmouth Town Council and Historic England. Work is now well advanced on the preparation of a project proposal that will be sent to potential funders in the hope of securing sufficient funding to enable restoration work to start (subject to the granting of formal approval since both sites are Scheduled Monuments). The eight photographs in the photo gallery show the clearance work under way, the cleared site and a member of the local fire brigade putting a damper on proceedings having been called out by passing motorists who were alarmed by the bonfire.